, invites her friends to explore the whole world. The 670-guest cruise ship intends to take another World Cruise in 2020. 2019 World Cruise on Pacific Princess appeared to be so popular that the cruise line decided to offer the same itinerary in the year 2020. The ship will depart from Fort Lauderdale on January 5, 2020 and Los Angeles on January 20, 2020. The ship’s guests will call at the ports of 26 countries on five continents. This exciting adventure will last 111 days. 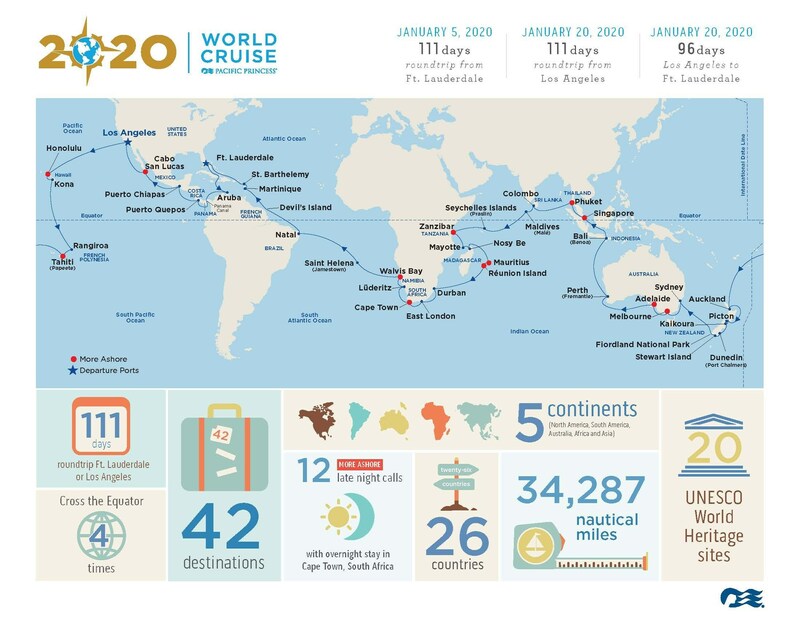 Let’s check the map of the Pacific Princess 2020 World Cruise! By the way, bookings for the Pacific Princess 2020 World Cruise begin today, on April 25, 2018.